Last week we ran our first ever Woodlore Wilderness First Aid course, the second stage in our brand new series of wildnerness first aid courses run in conjunction with Fusion Medical Limited. The course was a great success with all of the clients getting involved with the realistic and challenging first aid scenarios they were faced with, ranging from minor cuts to severe burns and major head injuries. All the scenarios and injuries are based on real-life situations that could occur at home, at work or in the wilderness. We now have a biography for Jamie Cooke from Fusion Medical Limited on the Specialist Instructors page of our website. 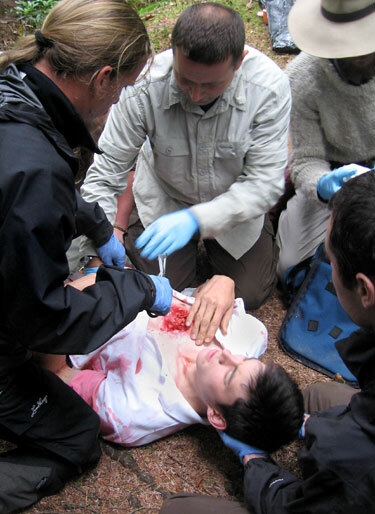 Jamie and his team from Fusion Medical Limited provide the first aid teaching on the series of Wilderness Emergency Medic courses Woodlore offer. This entry was posted in Bushcraft Courses & Expeditions on August 13, 2010 by Woodlore Team. I agree Mark. The bubbling FX must have been gruesome! Glad it wasn’t for real though – I’m not sure if I’d cope with seeing Dan this badly injured for real! was just a pity we missed the bubbling special effects of the sucking chest wound….sure it was awesome though!! !